I’ve always found that players lack for things to spend their money on on most standard D&D games. Unless you’ve developed rules for equipment degradation they are pretty well geared up within the first few levels. Totally agree. I think this is a good area of improvement for games focused around treasure as XP. Making such a system work requires a lot of referee effort spent in generating appropriate supply to meet PC demand or extremely proactive players. A 3E-style magic mart is another approach, but I prefer a more subtle magic economy. Carousing and magic research are other partial solutions. Even with equipment degradation, PCs still accumulate a lot of money, I find. This dynamic has been on my mind as I have been working on things lately, and this banking idea is (a small) part of a complete solution. The “magic mart” economy is the quickest way to break your game, I’ve also found. I’m curious to see what John (or others) have come up with to create supply for a loot economy that will be useful for most players. Torchbearer has achieved this with how it handles resources and lifestyle costs, but those rules don’t translate back to D20-based systems so easily. Maybe I’ll get to handling this myself. D’oh, I credited the post author as John and can’t go back and edit. That should read, I’m curious to see what You (and others) have created to create supply. . .
I’m working on a project (that these banking rules were excerpted from, actually) that tries to handle this more comprehensively, but it is not yet at a stage where I want to talk about it publicly yet. Stay tuned though! I now think that system is a bit heavy in the upkeep requirements area, but I still think it has some good ideas. So the heroes deposit the dosh with the bank, and at that moment receive the XP. But they also gain interest on the deposit? Depreciating, transferable notes of credit were a rather late discovery. You would be in your rights to have the bank change it’s interest rate on deposits or even do away with further interest paid. Correct. I have another version of this system that does not provide interest, but I do kind of like the detail and texture it provides. Not mentioned above, but I would probably have banks only offer limited convertibility during each downtime (either 1 note, or perhaps a number of redemptions based on a die roll). Reflecting historical developments accurately is not a priority here given that this is for a game about fantasy adventure (though economic history is actually a separate interest of mine). I agree regarding expenses that encourage adventure, but I think this happens naturally. Players seem to like to buy stuff that makes their characters more effective. So far, I have not distinguished between expenditures allowable by class because that also seems to be handled by the invisible hand. Magic-users spend money researching spells, other characters carouse or buy premium adventuring equipment, and so forth. There are two systems I have been using for retainer advancement. One is as a simple added expense. Spending 2 GP nets the PC 2 XP (for the spending) and buys 1 XP for the retainer. This naturally guarantees that retainers remain behind primary PCs, and is easy to remember. 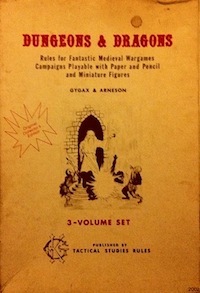 It is the rule active in my OD&D Vaults of Pahvelorn game. The fictional justification is “training.” There are some added benefits for fighters that has never come up in play and is probably too complicated to stick. I will probably remove it when I get around to compiling the Pahvelorn Player’s Guide. The other system is that retainers just remain one level behind the primary PC. This approach is simpler, and I think I prefer it, but it does require that some limitation be placed on the number of retainers a PC can have. I don’t mind that limitation so much though, as a player with too many actions per turn slows the game down. I think both of these methods could comfortably coexist with the bank rules. Yeah, carousing is an interesting case. I see it as a risk/return proposition. If XP has already been awarded for recovering treasure (as most people do), then carousing offers an option to earn some additional XP at the cost of potential consequences (assuming Jeff’s “party like it’s 999” carousing rules, if a poison save is failed). There may also be some informal expectation that “interesting” events might be triggered. In my Pahvelorn setting, a carousing result led directly to the discovery of a new demi-human race/class (the ratling). As a side note, in the games I have run recently there are no XP rewards for defeating monsters. The only way to get XP is to spend treasure. How you get that treasure is completely up to you as a player. I feel like that offers the greatest scope for strategy and creativity. I considered dropping XP for monsters altogether, but I kinda like the idea of fighting-men getting it, plus it creates some inter-party conflict because their interests don’t entirely match up, though XP for treasure should vastly outweigh any other source; I just want to make the party dynamics more interesting, not destroy them! In my game, I’ve provided a very short list of public buildings for players to build. They’ve been building temples, hospitals, and towers for sages. ever since. Hiring of sages, specialists, and spies has also been very popular. Hey, I just noticed your comment in the spam filter. Sorry about that! Is that short list available anywhere? What is the benefit of building a temple or hospital? Reaction roll bonus with the local population and favors from the church? Neat idea but I cannot drop banks with paper notes into a Bronze age campaign. I reckon a gold sink (s) is pretty vital for a long running campaign. The last thing you want is everyone with a million gp in the vault. As my players have zero interest in wasting money on castle structures in a domain type game I use a combination of venal officials, taxes, carousing, equipment repairs, temple contributions, magic research, investment opportunities with merchant houses (opening up marginal land for agriculture, new trade routes), potion materials, straight out theft by third parties, exotic items that are basically useless but status enhancing if you own and wear them, etc. Generally hungry and poor PCs are incentivised to get out there and adventure. I imagine you could paint a similar system as accounts with a grain merchant or something. Such existed in the ancient near east and Mediterranean classical world, I believe, if you want historical precedent. Interest rates are known to have been set in three primary civilizations at the outset of their commercial takeoff — Bronze Age Sumer, classical Greece and Rome — and to have remained remarkably stable over the course of each society. Not much is known about the early history of commercial credit. Little has changed since Leemans acknowledged that he was unable to find an explanation for the origin of the 20 per cent interest rate for silver loans. Steinkeller points out that “Loan documents are in general quite rare before Ur III.” Most recently, Renger has confirmed that, “Despite the appearance of a number of important articles and monographic studies covering particular periods and specific aspects connected with the problems of credit, no comprehensive investigation encompassing the vast amount of loan documents in their totality is available.” Why did some loans bear interest, and others not, he asks; and why did silver loans usually bear 20 per cent interest, in contrast to the Old Babylonian period’s 33 1/3 per cent for barley loans? Buying property, means of production, shares in enterprises etc. with adventuring loot, should also count as spending treasure. That way the rule can support the domain game. Banking essentially is a form of investment – as long as you keep two sets of books, one for uninvested treasure and one for wealth gained through rents and commerce. Maybe in this way a legitimate enterprise can be a form of money laundering? Maybe dead kings sense the disposition of their looted currency? Yeah, I have not needed to distinguish between types of spending so far when using treasure spent = XP. The bank note rules are primarily a method of easy bookkeeping with a slight incentive to making such endgame purchases (which I have seen players engage in to some degree without such systems, but also seem easy to forget about in an “out of sight, out of mind” kind of way). So this also serves as a systemic prompt that buying ships, mercenary companies, and castles is explicitly part of the game. Aside: though I have treated all wealth similarly so far, there is actually a potential issue with this. If you assume that PCs can reliably sell equipment (using the somewhat standard “sell for half new price” approach enshrined in computer RPGs), then you can gain extra XP by continuously selling and buying and selling. Summing the infinite series of 1/2 + 1/4 + 1/8 etc leads to a 200% multiple of XP. For example, assume 100 SP spent on a sword, that sword sold for 50 SP, and so forth (XP = 100 + 50 + 25, etc). This has never come up in play, and I am not sure it is really a problem in any case, as there is at least some sort of trade off (100 XP + a sword vs. ~200 XP), but it is a property of granting XP for spending money if the logic is followed to its conclusion. I’ve been thinking about the idea of Faction Cost as well. With my personal setting heartbreaker decent items (like heavy armor, henchmen above 0 level, quality weapons, alchemicals, and animals) are only available by spending “reputation” with factions. From many factions, temples especially, donations might be a good way to model this. Haven’t decided yet. I like bank notes, and think they make a lot of sense in a game with travel. If banks honor eachother’s notes and communicate with each other – maybe magically? I can see notes being the only way to use one’s treasure in a new area (10,000 gp is not safe to carry on the roads). Also if banks use magic for communication I can see there be “bank warlocks” (enslaved air elementals make great messengers, and wizard lock would be very useful on a vault) and even “bank priests” for laying a quest spell on major debtors. Now I’ve gotta think up a banking god. Either way, I bet fees would be associated with drafting a magically certifed note, relaying it’s authenticity to a distant bank and wizard locking the collateral in a vault. Likely 10% on any note over 10,000 gp or a flat 1,000 gp on less. Such fees are definitely fictionally reasonable, but if they are to be built into game systems one needs impartial (and probably abstract) ways to represent the risk involved in non-banked treasure. Otherwise, players are just going to keep everything in cash. That is why I found it easier to use interest here, to provide a positive incentive rather than deal with the bookkeeping hassle of theft chance, taxation, etc (which might just drive the game into “how to avoid tax collectors” adventuring). I think this system would actually still work sans interest (just flat 1000 GP face values forever), assuming that getting XP immediately without buying something directly is of value to players or that banknotes are required for certain (probably big-ticket) items. You could probably use this basic structure to model those reputation points. A 1000 GP donation to a temple would buy you one reputation point with a given organization, which could be cashed in for various benefits. Such a system would probably work very similarly to how banking is sketched out here, but would not be generally redeemable (unlike a bank note, a point of reputation with the temple of Apollo would not get you anything from the Magician’s Guild). This does require putting in the time as referee to construct the supply, which really is a lot of work, and requires predicting what players want to buy for their characters, but would be valuable if you could get those details right. Using donations here (rather than awards for services) plugs nicely into a treasure for XP system, which is attractive to me, though it is of course possible to give other ad hoc XP awards for getting (or spending?) reputation points, maybe 1000 XP each. The downside here that I see is that you lose some of the simplicity of a single “banknotes” record on the character sheet, as you need to track reputation with potentially many different organizations. This post actually got me thinking about rules I’d like to add for D20-based games. This is what I brainstormed last night. At the end of every encounter you must test to see if your weapon is damaged or broken. Roll the weapon’s damage die. If a the result comes up a “1”, it degrades a condition. If it’s in good repair, it is now damaged. If it is damaged, it is now broken. Damaged weapons are not as effective in combat. Reduce all damage done by half, rounded down to a minimum of 1. Track damaged weapons on your sheet by underlining them. This is to remind you that they need to be repaired. Broken weapons can be repaired but, with few exceptions, they will never be restored to their former glory. Reduced the damage die by one step on the die chain for any broken weapon that gets repaired (DCC rule). For more traditional games, just add a cumulative -1 penalty each time a weapon is broken and repaired. If a weapon would be rolling a D0 or a has received enough penalties to equal its maximum damage value it shatters, becoming irreparable. Track broken weapons by crossing them out on your character sheet (this is to remind you that you can’t use them until they’re repaired). For masterwork and magic weapons, if a “1” is rolled, re-roll the die. If the second roll results in a “1”, the weapon degrades. Magic and masterwork quality weapons can always be repaired to their original values. At the end of every encounter you must test to see if your armor is damaged or broken. Roll a 1d6. If a the result comes up a “1”, it degrades a condition. If it’s in good repair, it is now damaged. If it is damaged, it is now broken. Leather Armor does not degrade. Damaged armor is not as effective at protecting you. Reduce it’s AC bonus by half rounded down to a minimum of +1. Track damaged weapons on your sheet by underlining them. This is to remind you that they need to be repaired. Broken armor offers no protection. Broken armor can be repaired but, with few exceptions, it will never be restored to its former glory. Reduce the AC bonus by -1 permanently upon repair. Armor that is reduced to an AC bonus of 0 shatters and cannot be repaired. Track broken armor by crossing it out on your character sheet (this is to remind you that you can’t use it until it’s repaired). After each use, you must check to see if tools are broken. Roll 1d6. On a roll of “1”, the item is broken. Hmmm. . .maybe I should submit this for Crawl! Hmm, I kind of like damaged weapons and armor being only half effective (rather than the downgrading die type in DCC dice chain style for weapon damage and one less AC bonus for armor that I have been doing recently). Will consider more. I think there is drag imposed by the “roll an extra die” approach to determining if an item is broken though. It’s really easy to forget if it’s not already part of the standard workflow. I have had good luck myself building the check for degrading directly into the attack roll (I also theoretically do the same thing with ability checks when using equipment, though it has not come up that much yet). I don’t think it will be too huge of a drag, honestly since you’re just looking for the roll of a 1. It will definitely take some re-learning to remember to do it, but will be just as intuitive as rolling initiative once you get the hang of it. I love this idea. But inherent in my table’s XP is getting XP from observing monsters, not just fighting them. It would entail a second set of books and I’m lazy.